A couple of weeks ago I had one of those all too-seldom opportunities to sit down with a fellow special needs mum and enjoy a cuppa and a chat. Our conversation, as often does, found its way to literally talking about what we as SN mums talk about together that we can’t (or simply don’t) talk about with non-SN folk. It is always cathartic to be free to Talk Taboo…and to talk about talking about taboo subjects. Yeah, we really do that when we get together! Order a hot chai latte, a blueberry muffin, grab a seat and away we go. You would probably be astounded at the subjects we can cover in under 15 minutes. We can go from birth to death to funeral arrangements in under 60 seconds. It’s one of our superpowers. As we sat there, the warm scent of the spices wafting up from my chai latte, I told her that I finally wrote down my wishes for my son Brendan Bjorn on the DNR form. That’s “Do Not Resuscitate” for those not familiar with the lingo of our journey. That form is now in the hands of my son’s Life Limiting Illness Nurse and his paediatrician, being worked into a legal document that will enable my wishes to be heard at “that” moment…in case I am on the figurative and/or literal floor unable to speak. 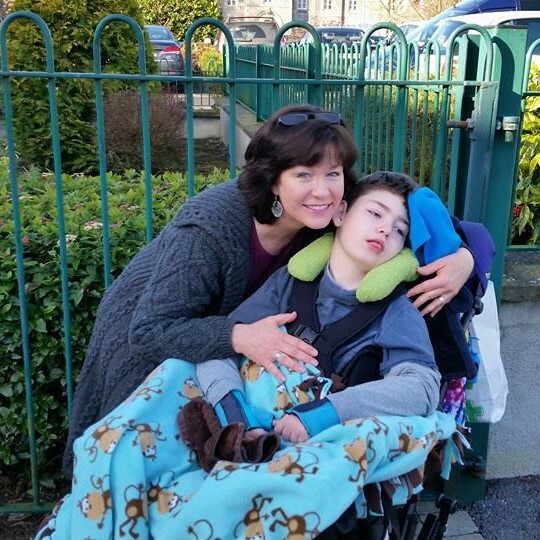 I gave the form to his nurse last week, at which time she said to me, “Tracy, you realise that if you aren’t present when Brendan goes into a medical crisis, they may not be able to put him on life support until you get there to say goodbye, right?” Yes. Of course I said yes, I realise that…but IF, just IF…then please have them do that so I can be there to let him go. “But there are no guarantees…” Yes. Again, yes, I know, all too well. Back to the chai. It isn’t uncommon that those of us on this journey can sit down over a meal and discuss bodily functions that would repulse the likes of “ordinary” people. And you got it – we even talk about the fact that we talk about that when others can’t! We often find humour in strange places. Find humour where you can, could be one of our mottos! So I took another sip of my chai latte, and without missing a beat, I said how I plan to have my son cremated and then one day, when it is my turn, buried with me. And there it is. Talking Taboo. My living, loving, amazing, precious angel of a son and I just said what I have planned when he transitions from this life. Why am I writing this, you may ask? Because, as with any of my writings, it is to enlighten those not on this journey and to give voice for those on this journey who are unable to find the words. And selfishly, there is that cathartic nature to writing, just as mentioned above when talking to a friend. Putting such taboo thoughts…realities…into words, be they vocalised or written, help to release those very thoughts from our ever-heavy hearts: I’ve said it. I’ve written it. Now, I can release it. Well, maybe not release it fully. But it does help. We need to talk about what is taboo. Otherwise, it will slap us in the face, us unprepared, caught off guard, having never allowed ourselves the liberty to mention the unmentionable. Allow it, because there are times during this journey that brings us parents to our knees. One of those unmentionable times I shared with his nurse last week. I talked taboo as I told her there have been a few times when I’ve held my son in my arms – him laying in a hospital bed with tubes and mask and lines of all sorts coming from his body – and I’ve whispered in his ear, “Angel, if you want to go, you can go. I’ll be ok” as the tears streamed down my face (and as they are as I type this, in fact). “Thank you for teaching me what love is…let go if you want, if it is your time…” But it wasn’t his time. So know this, that those of us in these shoes have probably all said these words to our very own children who have a life limiting illness. They are so fragile that we never know if they will pull through with each round of sickness that affects them. We have said it’s ok to fly, if it’s time, fly. And the fact we have said it is ok. It truly is ok.
It’s not taboo. It is loving unconditionally. The cost of caring. The cost of not caring.